As the years passed, M. Night Shyamalan found it more and more difficult to get viewers to patronize his movies. The director’s two biggest hits came from 1999’s Sixth Sense and 2002’s Signs, two of his first three mass release projects. After that, Shyamalan encountered diminished returns. 2010’s Last Airbender actually took in a decent total, but with an enormous budget, it failed to turn a profit and became another strike against the director. 2017’s Split finally brought Shyamalan back to popular prominence. While its gross became similar to that of Airbender, its miniscule $9 million budget meant it made a massive profit and gave Shyamalan’s career a real boost. 2019 brought the inevitable sequel with Glass. Because he apparently cannot suffer any kind of physical injury, David Dunn (Bruce Willis) acts as a do-gooding vigilante known as “The Overseer”. David rescues four female cheerleaders abducted by Kevin Wendell Crumb (James McAvoy). A man with multiple personalities, his form as “The Beast” may boast his own super powers, and after David and Kevin battle, both end up in police custody. This sends the men to a local facility for the criminally insane where they go through sessions with psychiatrist Dr. Ellie Staple (Sarah Paulson). She also works with long-term patient Elijah “Mr. Glass” Price (Samuel L. Jackson), a former foe of David’s. Mr. Glass boasts malevolent plans that also involve David and Kevin. Glass acts as the direct sequel to Split, since its events take place soon after the 2017 film’s conclusion. However, it also becomes the third flick in Shyamalan’s trilogy, as it finishes the series he started way back in 2000 with Unbreakable, the tale that introduced David and Elijah. Why did it take Shyamalan so long to continue the story? Mainly because Unbreakable underperformed at the box office, I suppose. While it probably made a little money, it was expensive for its time and not the big hit the studio expected after the massive success of Sixth Sense. With the first two films in the trilogy, we found efforts of very different quality. I thought Unbreakable became a pretty satisfying variation on the superhero genre, but Split seemed like a hamfisted, silly and campy flick that didn’t work for me. 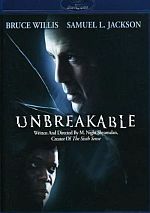 While not up to the level of Unbreakable, Glass manages to complete Shyamalan’s trilogy on a reasonably positive mote. No, it doesn’t create a wholly satisfying tale, but it does more good than bad. Especially during the highly compelling first act. We get a tease of David’s return at the very end of Split, and the initial section of Glass largely focuses on him. This means we get an update on his status over the prior 18 years and see him in action today. The movie re-introduces David well and develops the battle with Kevin in a satisfying manner. Though not action-packed, the second act’s view of David, Kevin and Elijah in the psychiatric facility also fares pretty well. Shyamalan allows the three to progress in a compelling way and he sets up conflicts with a clever view of the possibilities. The actors help. Over the last few years, Willis has become the king of the “paycheck movie”, a man apparently willing to lend his talent to any filmmakers who’ll give him money. This means an awful lot of projects in which a clearly disinterested Willis phones in his performances. Back with a more visionary director, Willis shows more signs of life than we’ve seen for a while. He seems delighted to revisit David and he relishes the ability to dig into a fairly compelling character along with two other eminently talented actors as well. Both McAvoy and Jackson also do nicely. 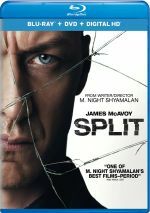 McAvoy dials back the campy aspects of Kevin from Split and becomes more convincing and menacing, while Jackson also dials down his usual shtick to make Elijah cool, intelligent and ominous. The scenes with all three men crackle. Glass sputters a little during its third act, partly because the first two work so well. Also, Shyamalan can’t resist the urge to give us an ending with some kind of “twist”. Not that one should expect a finale with a shocking reveal on a par with Sixth Sense or some of Shyamalan’s other works, but he does throw in a curveball. This seems a little on the gratuitous side, and I wish Shyamalan ignored that urge and gave the film a more traditional finale. Still, I don’t think the third act seems bad - it just doesn’t work as well as the first two. Glass still winds up as a pretty good take on the superhero genre and a fitting conclusion to a long-in-gestation trilogy. Glass appears in an aspect ratio of approximately 2.39:1 on this Blu-ray Disc. The movie came with an appealing presentation. Overall sharpness remained good. A smattering of wider elements or interiors could seem a little soft, but those didn’t create real distractions. Instead, the movie tended to be accurate and concise. I noticed no shimmering or jaggies, and the film lacked edge haloes or source flaws. The palette mainly opted for a mix of the usual orange and teal, though occasional bouts of other tones – like a pink room or some purples – appeared as well. Within the stylistic choices, the hues looked fine. Blacks were deep and dense, while low-light shots depicted appropriate clarity. The image seemed to be more than satisfactory. With plenty of action scenes, the movie’s Dolby Atmos mix often opened up to give us active information. Downconverted to Dolby TrueHD 7.1, these used the various speakers to create an involving, effective sense of these situations and circumstances. The elements meshed together well and moved in a satisfying manner. Audio quality also pleased. Music was peppy and full, while dialogue sounded accurate and concise. Effects demonstrated good clarity and range, with fine low-end response as necessary. This wasn’t quite a demo-worthy track, but it fared well. In addition to an Alternate Opening (2:13), we get 12 Deleted Scenes. These fill a total of 13 minutes, 36 seconds. The “Opening” introduces the movie’s main location earlier than in the final cut, while the rest of the scenes tend to add character beats. I can’t claim any of these bring us remarkable information, but they’re watchable and moderately interesting. We can view the scenes/”Opening” with or without introductions from writer/director M. Night Shyamalan. He gives us some notes about the sequences and why they didn’t make the movie. These add good insights. A slew of featurettes follow, and The Collection of Main Characters splits into four subdomains. All in all, these span eight minutes, 43 seconds and include notes from Shyamalan and actors James McAvoy, Samuel L. Jackson, Anya Taylor-Joy, Charlayne Woodard, Spencer Treat Clark and Sarah Paulson. As expected, the clips look at cast, characters and performances. Nothing especially interesting appears in these fluffy segments. Next comes A Conversation with James McAvoy and M. Night Shyamalan. In this five-minute, 10-second reel, the actor and filmmaker discuss aspects of the production. A few decent nuggets emerge, but much of the chat feels superficial. With Bringing the Team Back Together, we find a two-minute, 54-second clip that offers notes from Shyamalan, Jackson, Clark, McAvoy, Woodard, Taylor-Joy, Paulson, 1st AD John Rusk, key grip Jon Sibert, A Camera 2nd Assistant Leon Sanginiti Jr., scenic charge Nell Stifel, and producer Jason Blum. They tell us about how many cast/crew members return from prior Shyamalan projects and convey that he heads a happy cinematic family. Virtually no information of use emerges here. David Dunn Vs. the Beast goes for two minutes, 11 seconds and features Shyamalan, McAvoy, Blum, executive producer Steven Schneider, and stunt coordinator Manny Siverio. We get some basics about stunts and action. Unfortunately, the emphasis remains on promotion and not substance. After this we find Glass Decoded, a two-minute, 52-second piece with Shyamalan. He discusses connections to earlier movies as well as color design. This becomes a decent little look at those areas. Up next we get Breaking Glass. It goes for one minute, 28 seconds and features McAvoy, Siverio, and Shyamalan. “Breaking” brings a few more basics about stunts. Like “Dunn”, it becomes largely puffy and superficial. During the two-minute, 54-second Connecting the Glass Universe, we hear from Shyamalan, Jackson, Paulson, McAvoy, Clark, and Taylor-Joy. They discuss the links to Unbreakable and Split. It lacks much depth. Via Behind the Lens, we locate a two-minute, 46-second featurette with Taylor-Joy, Paulson, McAvoy, Blum, Shyamalan, Clark, producer Ashwin Rajan, storyboard artist Brick Mason, and producer Marc Bienstock. Essentially “Lens” gives us praise for Shyamalan. Don’t expect more from it than that. Music comes to the fore with The Sound of Glass. It spans one minute, 50 seconds and includes Shyamalan and composer West Dylan Thordson. We get a few notes about the score in this passable overview. Visuals take the stage for Enhancing the Spectacle, a two-minute, 53-second segment with Shyamalan, visual effects executive producer Bob Lowery, visual effects supervisor Ruben Rodas, senior visual effects supervisor Edwardo Mendez, and CG supervisor Dan Borstein. “Spectacle” discusses some visual effects. It comes with a smattering of insights, though its brevity limits its usefulness. Raven Hill Memorial goes for two minutes, 16 seconds and offers statements from Shyamalan, Jackson, Taylor-Joy, Paulson, Bienstock, production designer Chris Trujillo and location manager Staci Hagenbaugh. This clip covers the movie’s main location and set. It becomes a moderately engaging reel. Finally, Night Vision runs one minute, 56 seconds and offers info from Shyamalan, Mason, Blum, Paulson, and director of photography Michael Gioulakis. We get more praise for Shyamalan in this forgettable sequence. The disc opens with ads for Seven in Heaven, Fighting With My Family, Doom: Annihilation and Arctic. No trailer for Glass appears here. 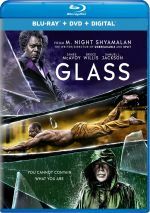 A second disc presents a DVD copy of Glass. It includes the deleted scenes, the alternate opening and “A Conversation” but it lacks the other featurettes. After more than 18 years, M. Night Shyamalan concludes his “Unbreakable Trilogy” with Glass. Though not on a par with the first film in the series, it seems vastly superior to the silly Split and it finishes matters on a positive note. The Blu-ray boasts very good picture and audio as well as a long but largely superficial set of supplements. 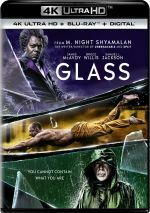 Glass gives us a good superhero flick and stands as Shyamalan’s best work in years.